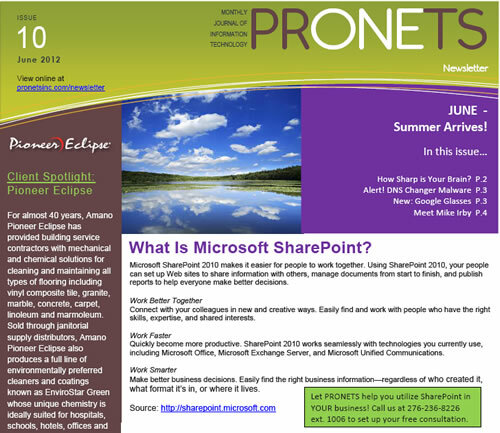 June's newsletter is packed with all kinds of great information, beginning with "What is Microsoft SharePoint?" and ending with a new baby! Test your mental sharpness with some brainteasers and learn more about one of Google's newest inventions. Read more about how to make yourself more memorable and meet one of our friendly technicians, Mike Irby. Click below to read the entire newsletter! We are in the process of consolidating our data infrastructure to our Galax, Virginia data center to better serve you. The move should improve uptime & reliability of our website and email services for you. Starting June 18 and continuing until the process is complete, you may experience brief outages of your PRONETS hosted website or email. Rest assured that we are aware of the situation and will have your services back up and running as quickly as possible. If you believe your website or email has been down longer than planned, please feel free to contact us to check in. Once the migration is complete, we will email an update to let you know. As always, thank you for your business and contact us if you have any questions or concerns. We’re excited to improve our service offerings in the future!